Hans Christian Andersen, or H. C. Andersen (April 2, 1805 – August 4, 1875) was a Danish author and poet. Although a prolific writer of plays, travel books, novels, and poems, Andersen is best remembered for his fairy tales, a literary genre he so mastered that his works have been immortalized in children's world literature. Andersen's popularity was not limited to children, however, as his fairy tales—called eventyrs, or "fantastic tales" in the Danish language—express universal themes that transcend age and nationality. Andersen's own life reads like a fairy tale. He was left fatherless at a young age; moved to Copenhagen to find his fortune as an actor at the age of fourteen, and improbably became a favorite of the king and upper class nobility. Andersen, who never married, seemed to be plagued by loneliness and feelings of being "different" throughout his life. He may have suffered from Marfan's syndrome, which can give a person an unusually large or misshapen appearance; he lived the life of a Victorian gentleman, and he projected his inner conflicts into often dark tales of hard-won redemption, such as the eponymous story "The Ugly Duckling." Like Charles Dickens, whom he met in 1847, Andersen expressed sympathy for the poor and idealized the innocence of childhood in his writings. Andersen's fairy tales have become culturally embedded in the West's collective consciousness, readily accessible to children, but presenting lessons of virtue and resilience in the face of adversity for mature readers as well. 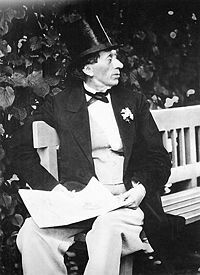 Denmark celebrated the life and works of Hans Christian Andersen in 2005, the author's bicentenary. Andersen was born in Odense, Denmark, on Tuesday, April 2, 1805. He was the son of a poor shoemaker and a washerwoman. Although his mother was illiterate, his father encouraged his son's imagination, reading to him from Arabian Nights and the Bible. He also took his son to see the plays of Danish playwright Ludvig Holberg. His father constructed a small toy theater that the young H.C. would use to stage dramas with hand-made puppets. As legend goes, he liked to recite plays by Shakespeare and would have his wooden dolls act them out. Although Anderson received a scholarship to study and sponsorship by King Frederick VI, he experienced many difficulties as a student. He lived at the headmaster's home at Slagelse where he was unhappy and purportedly treated badly in order to "build character." He was not a good speller and was discouraged from writing, a situation that may have been exacerbated by dyslexia. His difficulties in writing, however, were also what would ultimately enable him to write in an accessible language rather than in the more stilted prose of the Victorian era. His genius as a storyteller would be reflected in his use of colloquialisms and chatty, humorous asides. His "author's voice" was unique in that his tales could be appreciated by children while at the same time, their hidden social satire could be enjoyed by adults. He published his first book, A Journey on Foot From Copenhagen to the Eastern Point of Amager in 1829. In the book, the protagonist meets characters ranging from Saint Peter to a talking cat. He followed this success with a theatrical piece, Love on St. Nicholas Church Tower and a short volume of poems. One of his most loved poems was dedicated to a fellow student's sister, Riborg Voigt, with whom he was in love. Purportedly a note to her was found in a locket around Andersen's neck at the time of his death. In 1831, the first of Andersen's travel books, Shadow-Pictures of a Journey to the Harz Mountains and Saxony, was published. It reflects his travels to Germany, where he was influenced by German literature, such as the folk tales of the Grimm Brothers. He then received a small grant from the King, and made the first of his long European journeys. In October 1834, he arrived in Italy, and inspired by the landscapes and local customs, Andersen would write his "breakthrough" book, an autobiographical work of fiction. Often Andersen would install himself as the main character in his stories, drawing on hardships and themes from his youth intermixed with his travel experiences. The Improvisatore, set in Italy, was published in 1835, and established Andersen as an international author. Although not a children's book, it is a "coming of age" story, or bildungsroman. Like others in this genre, notably Dickens's David Copperfield and Brontë's Jane Eyre, it concentrates on the hero's childhood, an increasingly important theme in Romanticism, which focused on the child's autogeneration. His initial attempts at writing fairy tales were rewrites of stories that he heard as a child. Andersen brought this genre to a new level by writing a vast number of fairy tales that were both bold and original. Initially they were not met with recognition, due partly to the difficulty in translating them and capturing his genius for humor and dark pathos. The year 1845 heralded a breakthrough for Andersen with four different translations of his fairy tales finding recognition. The first, The Little Mermaid, a coming of age story rich in symbolism, appeared in the popular periodical Bentley's Miscellany. It was followed by a second volume, Wonderful Stories for Children. Two other volumes enthusiastically received were A Danish Story Book and Danish Fairy Tales and Legends. A review which appeared in the journal The Anthenaeum (February 1846) said of Wonderful Stories, "…this is a book full of life and fancy; a book for grandfathers no less than grandchildren, not a word of which will be skipped by those who have it once in hand." Among his most popular tales were The Ugly Duckling, The Princess and the Pea, and The Emperor's New Clothes. Meanwhile, Charles Dickens was revolutionizing literature in England with his emphasis on emotional and sentimental content. A highlight of Andersen's European travels was a summer visit to Dicken's home in 1847. The two authors respected each other's work and had something important in common as writers: Depictions of the poor and the underclass, who often had difficult lives affected both by the Industrial Revolution and by abject poverty. In the Victorian era there was a growing sympathy for children and an idealization of the innocence of childhood. The death of a child is a theme that haunted Andersen and is depicted so poignantly in another favorite tale, The Little Match Girl. In the 1830s and 1840s, the time was propitious for fairy tales—once only re-told folk tales—to be regarded as a key element in nineteenth century culture and literature. Andersen's highly imaginative tales laid the groundwork for other children's classics to come, such as Wind in the Willows by Kenneth Grahame and Winnie the Pooh by A.A. Milne. His employment of the revolutionary technique of making toys and inanimate objects come to life (Little Ida's Flowers) would be a stratagem used later by such authors as Lewis Carroll and Beatrix Potter. Although Andersen published other novels, O.T., To Be Or Not to Be, in 1857, and his autobiography, The Fairy Tale of My Life (1855), he would return to the writing of fairy tales and published them in installments until 1872. On April 2, 1875, at the age of 70, his health failing, Andersen was feted by Danish society. He died later that year on August 4, at Rolighed, the home of close friends. Although Hans Christian Andersen was sustained by the many friendships in his life, in the end he had no real family or home of his own. He was buried alone at Assistens Cemetery in Copenhagen. Hans Christian Andersen was also renowned for a different type of work that also involved paper. Andersen was a very popular paper cutter who would amuse his friends and their children with his paper cutting skills. Friends and acquaintances were all in awe of his skills in this area. He would often accompany his paper cutting with a fantastic tale, and end the tale by unfolding the paper to the amazed listeners. He frequently gave the paper cuts as gifts to his listeners. The paper cuts were not only brilliantly artistic but also a challenge to the mind. There was usually a double meaning hidden in the paper cuts, much the same way he wrote his fairy tales. About 1,000 of his paper-cuts of all sizes still exist to this day. Most English (as well as German and French) sources use the name "Hans Christian Andersen," but in Denmark and the rest of Scandinavia he is usually referred to as merely "H. C. Andersen." His name "Hans Christian" is a traditional Danish name (and is used as a single name; it is incorrect to use only one of the two parts). It is an accepted custom in Denmark to use only the initials in this and a few other names (examples include "H.P.," short for "Hans Peter" and "J.C." or "I.C" short for "Jens Christian" and "H.H" short for "Hans Henrik"). H.C. Andersen's stories and Copenhagen's Tivoli Gardens were to serve as inspirations for the modern legacy of Walt Disney. Disney turned many of Andersen's stories into animated movies that were enormously popular. On a trip to Copenhagen in 1951 Disney visited Tivoli Gardens, the world's first theme park built in Copenhagen in 1843, and opened his Disneyland in 1955. "Andersen," said Disney, "was a great inspiration to me." Daughter of the Forest by Juliet Marillier: A romantic fantasy novel, set in early Ireland, thematically linked to "The Wild Swans." "The Snow Queen," a short story by Patricia A. McKillip (published in Snow White, Blood Red). "You, Little Match Girl," a short story by Joyce Carol Oates (published in Black Heart, Ivory Bones). "Sparks," a short story by Gregory Frost (based on The Tinder Box, published in Black Swan, White Raven). "Steadfast," a short story by Nancy Kress (based on The Steadfast Tin Soldier, published in Black Swan, White Raven). "The Sea Hag," a short story by Melissa Lee Shaw (based on The Little Mermaid, published in Silver Birch, Blood Moon). "The Real Princess," a short story by Susan Palwick (based on The Princess and the Pea, published in Ruby Slippers, Golden Tears). "The Pangs of Love," a short story by Jane Gardam (based on The Little Mermaid, published in Close Company: Stories of Mothers and Daughters). "The Chrysanthemum Robe," a short story by Kara Dalkey (based on The Emperor's New Clothes, published in The Armless Maiden). "The Steadfast Tin Soldier," a short story by Joan Vinge (published in Women of Wonder). "In the Witch's Garden," a short story by Naomi Kritzer (based on The Snow Queen, published in Realms of Fantasy magazine, October 2002 issue). "The Last Poems About the Snow Queen," a poem cycle by Sandra Gilbert (published in Blood Pressure). ↑ Jackie Wullschläger, Hans Christian Andersen. The Life of a Storyteller (Penguin, 2000, ISBN 0226917479). "Hans Christian Andersen." Encyclopedia of World Biography, 2nd edition. Gale Research 1998. "Hans Christian Andersen." Major Authors and Illustrators for Children and Young Adults, 2nd edition. Gale group, 2002. Dalager, Stig Journey in Blue, historical, biographical novel about H.C.Andersen, Peter Owen, London 2006, McArthur & Co., Toronto 2006. ISBN 0720612691. Owens, Lily. The Complete Hans Christian Andersen Fairy Tales. Gramercy, 1993. ISBN 0517092913. Wullschläger, Jackie. Hans Christian Andersen. The Life of a Storyteller. Penguin, 2000. ISBN 0226917479. Hans Christian Andersen's Life and Works, Hans Christian Andersen Center. Simon, Scott. 2005. Danes Mark Hans Christian Andersen Bicentennial. National Public Radio. Har'El, Zvi. Hans Christian Andersen: Fairy Tales and Stories. Hans Christian Andersen Fairy Tales in English, Russian and Ukrainian. Works by Hans Christian Andersen. Project Gutenberg. 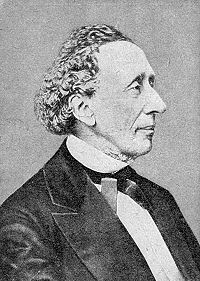 History of "Hans Christian Andersen"
This page was last modified on 26 July 2017, at 16:48.